Last week, we kicked off this year’s Great Halloween Baby Names contest. Now it’s time for the Great Halloween Baby Names 2018 SemiFinals: Harry Potter edition. 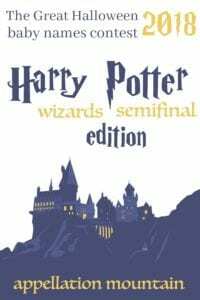 This contest is for the names of wizards; the witches’ semifinal round posted earlier today. All of our names are drawn from the witches and wizards that we know and love from the original seven-books series. Some of them behaved heroically; others were the villains of the tale. But it’s not about separating the worthy characters from those we find lacking. It only about the names that we like best. After all, JK Rowling is an equal-opportunity namer, giving outstanding names to characters good, bad, and hard-to-say. So if you’re among the handful of people who have never read a page of a Harry Potter novel? No worries. Just vote for the names that strike you as the best. Noble Arthur carried the day, earning 18% of the vote. Cedric came in at 15%. Ollivander and Alastor tied at 12%. Sirius scored 9%, just a few votes ahead of Phineas’ 8%. Rounding out our contest, Draco took seventh place with 6%, and Kingsley came in eighth with 5%. The four names that don’t advance are Remus, Neville, Severus, and yes, Harry. Remember – it’s not about the characters! It’s about the names. The winner of each new match-up advances to the Quarter Finals next week. On October 31st, we’ll learn the most popular witch and wizard names, and they’ll share the title of Halloween Baby Name of 2018. Two of the good guys’ names face off this round. An Old English name or a night sky appellation? Invented Ollivander or throwback Phineas? Two great examples of Rowlings’ naming prowess are matched up in this round. Easier than slaying a basilisk! Voting will stay open until Thursday, October 18th. The results will be posted with the Quarter Finals round, beginning on Saturday, October 20th.